I bought my Specialized Saddle in July of 2015. 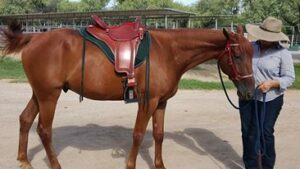 At the time I had two horses and wanted one saddle that I could use for both. I did my homework and checked out the saddles out there. This is something I have done many times before. It was my good luck when my friend Barb Heller decided to be a distributor for Specialized Saddles. I know Barb and I know she would never endorse something she didn’t believe in. She made a believer out of me. I have a Trailmaster Saddle and I ride trails two or three times a week. This has been the easiest saddle to “break in”. The seat is super comfortable and I like the position that I sit in. The saddle is wonderful quality, the builders did a great job. Both of my horses moved out more comfortably in the saddle. Did I mention the weight? That is a big deal for those of us who are a certain age and don’t lift 45lbs. like we used to. I have let numerous people “try” my saddle because I have complete confidence in it. So, I think you could say, I love my saddle. I thank you, my horses thank you. I hope to have many more happy trails!